The Enemy Within is the revised and updated Director’s Cut of one of the most highly regarded roleplaying campaigns ever written. 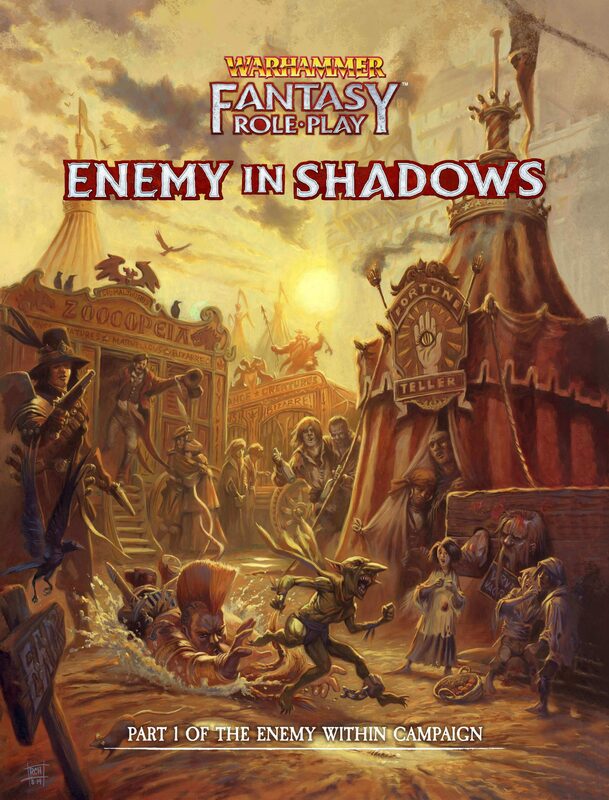 Enemy in Shadows presents the first part of the epic Enemy Within campaign, the sequence of Warhammer Fantasy Roleplay adventures that inspired a generation of gamers. So, gather your heroes as you take them from humble beginnings as penniless adventurers to the halls of the great and powerful, where every decision can change the fate of the Empire. The first two adventures of the Enemy Within campaign: Mistaken Identity, and Shadows over Bögenhafen, both of which are revised and updated by Graeme Davis, legendary WFRP author, and one of the original writers of the campaign. A selection of ‘Grognard Boxes’ that add entirely new ways to play through the adventures, ensuring even those who have played the Enemy Within campaign before will find Enemy in Shadows fresh and new. A complete guide to Bögenhafen, one of the most important towns in the Reikland, full of exciting locations to visit and explore. The indispensable companion to the Enemy in Shadows and the first part of the epic Enemy Within campaign. 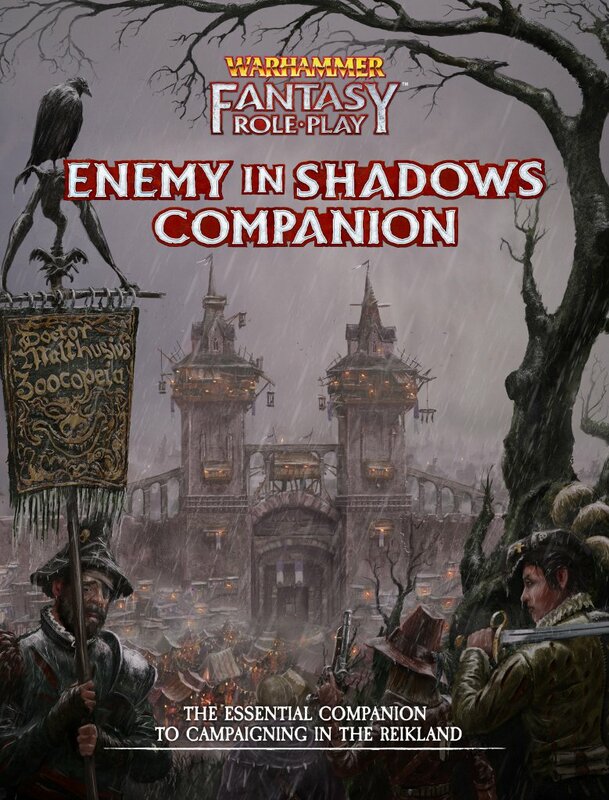 The Enemy in Shadows Companion is the first of our 5-part series of companion volumes to the Enemy Within campaign. It contains a wealth of supplementary material to not only expand Enemy in Shadows, but also support any WFRP games set in the Empire. Guest Commentaries: Phil Gallagher and Graeme Davis, two of the original Enemy Within campaign writers, reflect on creating one of the greatest campaigns ever written. The Empire: A deep examination of the Empire, the primary setting for the Enemy Within campaign. Ready-made Characters: A selection of 6 pre-generated Characters, with a variety of optional secrets and relationships to personalise them to taste. Road Travel: Full rules for travelling the roads of the Empire, and the road wardens who patrol them. Supporting Cast: A huge cast of incidental NPCs that can be added to any WFRP adventure, with hints and tips for how to use them. Bonus Content: A collection of short adventures and encounters that can be added to any WFRP game, including revised and updated versions of classics such as On the Road, The Affair of the Hidden Jewel, and The Pandemonium Carnival. We will update you more as we can! Update: WFRP Core Book Pre-Orders » « C7 are 10 Years Old! !